Fall Tennis details are subject to change. 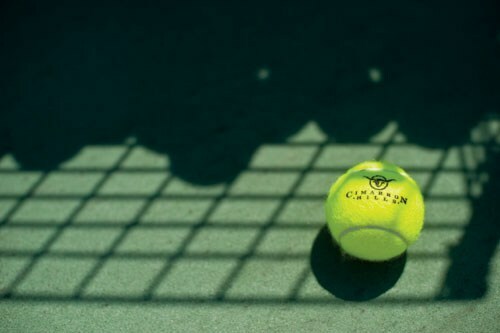 Through our continued partnership with Cimarron Hills, Fall 2019 Tennis will consist of three competitive teams: Middle School, JV and Varsity. Unlike previous seasons of Meridian Tennis, there will be tryouts to form this season's teams. Cuts are possible. Developmental Tennis will not be offered this season. Students who do not make a competitive team or who are interested in learning the sport of tennis are welcome to contact the Tennis coaches to inquire about private lessons. Meridian will offer three teams for Fall 2019 Tennis. * High School teams will train separately but during the same practices. Therefore the maximum is for both the JV and Varsity teams combined. Tuesday, May 7 – Registration closes. Saturday, May 18 - Free Physicals Event. Tuesday, May 21 - Physical forms due. Email a PDF to Physicals@mwschool.org. Physicals must be valid until November 6, 2019. No late registration will be available for students enrolled in Meridian during the registration window. Sport registration for newly enrolled Meridian students will be open June 3 - August 2, 2019. Please contact Meridian's registrar for access to the New Student Sports Registration. Participation fees includes 19 practices, up to 4 matches and a Meridian Athletics practice T-shirt, which is also approved spirit wear. Participation fees includes 27practices, up to 4 matches and a Meridian Athletics practice T-shirt, which is also approved spirit wear. Please bring a check payable to Meridian School to tryouts. Payment is due at the conclusion of tryouts to secure your spot on your team. Meridian School wants all students to have the opportunity to participate. Financial assistance and/or payment plans are available for those who need it. Please contact financialaid@mwschool.org for questions about payment plans and/or Athletics scholarships. Cimmaron Hills works with area schools to establish a match schedule that is challenging and fun for our Fall Tennis players. Middle School Tryouts will Thursday, August 22nd from 5:00-6:30pm at Cimarron Hills. JV and Varsity Tryouts will be Friday, August 23rd from 5:00-6:30pm at Cimarron Hills. Unless there are fewer than 12 qualified high school tennis players to try out, there will not be an opportunity for 7th and 8th grade students to "play up" on the JV or Varsity teams. In otherwords, 7th and 8th grade tennis players will be eligible for the Middle School team only. Meridian Tennis coaches will work together to determine which players make the team(s). They will use a rubric similar to the one used for the State Tennis Team Tryouts to assess the student athletes. Here is the rubric from the State Tennis Tournament Tryouts to help all student athletes prepare for tryouts. Also, please see the Lines on a Tennis Court and Spaces on a Tennis Court documents. Student athletes participating in Fall Tennis will receive one loaner Meridian Tennis jersey, which is to be worn to all matches. Replacements for damaged or lost uniform jerseys must be purchased for $45 each, and student athletes cannot compete unless they are wearing the approved uniform jersey. Tennis players must provide their own black or khaki tennis bottoms to complete their match uniform. Tennis players must also provide their own tennis shoes and racket. For practices, Fall Tennis players will be provided with a Meridian Athletics spirit wear T-shirt which they can wear to practices with athletic bottoms. Or, Fall Tennis players can wear other Meridian spirit wear and athletic bottoms to practices. Additionally, tennis players should wear tennis shoes and bring their rackets to all practices. All practices and matches are held off-campus. Practices are at Cimarron Hills Tennis Center, and many of the matches will be there, too. Some matches are at area schools. Meridian does not provide transportation for any Athletics activities, including Tennis practices and matches. Meridian and its coaches cannot make arrangements or suggestions about transportation either. However, the parents of those registered are provided with a list of parent emails for all those who are participating in this sport, this season. Parents are welcome to use that list to make transportation arrangements on their own. (The parent contacts are not to be used for solicitation purposes.) Additionally, parents and players are encouraged to join the TeamApp team and use that tool to build the Fall Tennis community and arrange for carpooling.